Early stage of summer damp heat invasion or wind cold invasion with damp interior. Fever, headache, loose stools or diarrhea, epigastric or abdominal bloating, food poisoning, viral infections associated with the common cold, including stomach flu. 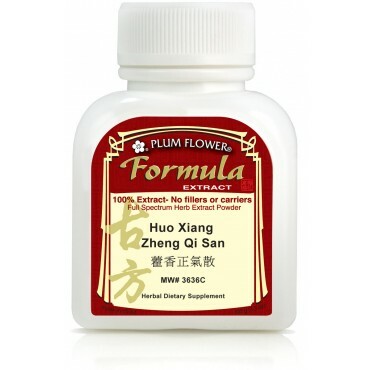 Acute food stagnation, motion sickness, overeating, acute gastritis are some of the imbalances satisfied clients have used this product for. Pogostemon cablin herb, Atractylodes macrocephala rhizome, Magnolia officinalis bark, Platycodon grandiflorum root, Citrus reticulata peel, Glycyrrhiza uralensis root, Pinellia ternata rhizome, Areca catechu peel, Angelica dahurica root, Perilla frutescens leaf, Poria cocos fungus, Zizyphus jujuba fruit, Zingiber officinale rhizome-fresh. - Huo xiang, Bai zhu, Hou po, Jie geng, Chen pi, Gan cao, Ban xia, Da fu pi, Bai zhi, Zi su ye, Fu ling, Da zao, Sheng jiang.